The Remington PG6025 All-in-1 is a lithium powered grooming kit that’s pretty easy on the eye and comes with a copious amount of accessories. But is it any good? Remington have been making grooming products for both men and women for a long time now. For men who may be running on a strict budget, paying over $100 for a grooming kit may sound too much for you. This is even more of a case if you only need a simple electric shaver to trim your beard or other general hair. – you really don’t want to be paying out big bucks for a beard trimmer. Well, Remington seemingly has a solution to the problem. The Remington PG6025 grooming kit is super affordable, and comes with several attachments making it possible for you to customize your look. The main question is whether it has hold it’s own as one of the better beard trimmers, or should you spend a little extra? The Remington PG6025 grooming kit offers a true all-in-one grooming keeping beards and mustaches neat and tidy. Alternatively, it helps you to trim your hair, chest, and back. The nose and ear attachments help to keep the areas that are hard to reach neat and tidy. The Remington PG6025 grooming kit is made to give high-quality cuts. Since it has self-sharpening blades, they are always sharp ensuring they give you a super close cut. The 3 head attachments available allows you to choose from a variety of lengths. Additionally, they make it possible to trim nose and ear as well as other parts of the body that are hard to trim. This trimmer uses a Lithium-ion battery. This battery is usually chosen as the best battery for trimmers since it lasts for a long time and it’s rechargeable. This trimmer uses a charging cord instead of charging stand. The Remington PG6025 all-in-1 grooming kit operates with the cord plugged in as long as you leave it to charge for a few minutes so that you don’t damage the battery. One of the strengths of the Remington PG6025 trimmer is that it comes with a variety of attachments to choose from. These attachments offer you all you would like to get from a trimmer. However, there’s no loads and loads of attachment, so many that you end up losing some of them. 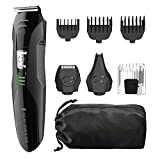 Additionally, this trimmer comes in a convenient storage pouch that allows you to keep the trimmer and the attachments intact for easy access when you require it next. This pouch is easy and simple to carry around while traveling. Just like any other product, this grooming kit cannot please everyone. Despite being a nice grooming kit, it has a few flaws. One of the main reasons that you might want to avoid this trimmer is that it fails to work with sensitive skin. It’s pretty cheap, so it’s not as high quality as a more expensive beard trimmer. Read through for the pros and cons of this trimmer. It cuts with surgical steel blades. The lithium-ion battery offers 60 minutes cordless runtime. This is more than enough time to perform the normal trimming. Has a well-balanced weight allowing the shaver to shave to the best precision. It has a handsome storage pouch making it easy to carry while traveling. The Remington PG6025 grooming kit has self-sharpening blades making it last longer than other similar shaving kits in the market. It has a poor battery life if you compare it to the other beard trimmers available. Reviews I’ve read have said that this trimmer only lasted a matter of 6 months before breaking – it might be a better idea to spend a bit more on a trimmer to avoid this kind of scenario. It’s a low cost low quality trimmer in general – I prefer something of a higher quality personally. I prefer the Mulitgroom like this guy. To conclude, the Remington 6025 is a pretty decent option if you’re looking for a fairly priced beard trimmer, though there are tons of other options. You won’t find many beard trimmers better than this on the market right now – at this price. If you have a few extra bucks to spend, you can probably find yourself a better option.